The Tahitian Dog (Tahitian: ʻŪrī Mā’ohi, literally translated as 'native dog'[B]) is an extinct breed of dog from Tahiti and the Society Islands. Similar to other strains of Polynesian dogs, it was introduced to the Society Islands and Tahiti by the ancestors of the Tahitian (Mā’ohi) people during their migrations to Polynesia. They were an essential part of traditional Tahitian society; their meat was included in Tahitian cuisine and other parts of the dog were used to make tools and ornamental clothing. Dogs were fed a vegetarian diet and served during feasts as a delicacy. European explorers were the first outsiders to observe and record their existence, and they were served to early explorers including Captain James Cook. The Tahitian Dog disappeared as a distinct breed after the introduction of foreign European dogs. The Tahitian Dog, known as the ʻŪrī Mā’ohi in the Tahitian language, was introduced to Tahiti and the Society Islands (in modern French Polynesia) by the ancestors of the Tahitian (Mā’ohi) people during their migrations to Polynesia. They were closely related to the Hawaiian Poi Dog and the New Zealand kurī; the latter is believed to be a descendant of the breed. Similar breeds of Polynesian dogs were brought alongside pigs and chickens when the people settled the islands of Polynesia. Genetic studies indicate that the New Zealand kuri/dog is derived from Indonesian dogs, and therefore by inference it is likely that Society island dogs are of the same origin. The Marquesan Dog became extinct in the neighboring Marquesas Islands before 1595. Even though dogs were virtually absent from Western Polynesia, they were recognized when European explorers later brought them as items of trade, indicating a universal cultural recognition of the dog in the many islands. Dogs were tied with strings around the belly and kept in the house where they were raised as a food source alongside domesticated pigs. Seen as a delicacy, they were served during feasts and to the high chiefs. Dogs were less abundant than pigs in the islands, possibly because they were killed while they were young. European visitors noticed that native women, especially those who lost their own children, would often breastfeed puppies and small pigs. They were an essential part of traditional Tahitian society. Dog teeth were fashioned into fishhooks and dog bones were made into weapons and implements. 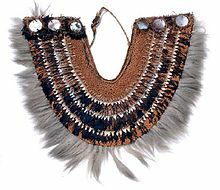 They also used dog hair, especially the long tail hairs of the Tuamotuan varieties of dogs, to decorate the fringes of the taumi – a traditional breast ornament often called a gorget – which were worn by priests and high chiefs. The Tuamotuan breed were described as similar to their Tahitian counterparts distinguishable by their longer hair. Historian Margaret Titcomb noted that Tuamotuan varieties may not have been a separate breed that developed in isolation, arguing that the people of the Tuamotus could have eaten their short hair varieties and kept their longer haired dogs for exports to the Society Islands. The Tahitian Dog became extinct in the Society Islands some time after the arrival of European settlers due to the introduction and interbreeding with European dog breeds. By 1834, British traveler Frederick Debell Bennett noted: "Amongst the Society Islands, the aboriginal dog, which was formerly eaten as a delicacy by the natives, is now extinct, or merged into mongrel breeds by propagation with many exotic varieties." Most other breeds of Polynesian dogs also became extinct due to interbreeding with foreign dogs by the beginning of the 20th century. This breed and other Polynesian dogs were sometimes considered a distinct species by 18th century naturalists and scientists, and received scientific names such as Canis domesticus, indicus taitiensis (1778) by Georg Forster, Canis familiaris villaticus, meridionalis (1817) by F. L. Walther, Canis otahitensis (1836) or Canis familiaris orthotus otahitensis (1836) by Heinrich Gottlieb Ludwig Reichenbach, Canis pacificus (1845) by Charles Hamilton Smith, and Canis familiaris otahitensis (1859) by Christoph Gottfried Andreas Giebel. Luomala noted that the "source material of taxonomists has been derived, often at second- and third-hand, from impressionistic descriptions by members of the expeditions of Captain Cook and other eighteenth-century explorers, none of whom give a single measurement or preserved a specimen for scientific study". A dog sitting below a boy in a outrigger canoe from Sydney Parkinson's A view of the island of Otaheite with several vessels of that island, c. 1773. The Tahitian dogs were described as having a small or medium build, resembling terriers or crooked-legged dachshund in size. Their coats were usually brown, white or rust-yellow with smooth hairs. They had broad heads, small eyes, long backs, sharp-pointed muzzles and erect ears. They were described as lazy, shy, and not ferocious, but as having notoriously bad dispositions. They seldom barked but sometimes howled. Often they are lumped together with the Hawaiian Poi Dog by 19th-century taxonomists because of their similar appearance and diet, in contrast to the kurī, which was much larger in size due to their higher protein diet. Their diet included breadfruit, coconut, yam and poi made from taro and sometimes fish. This soft vegetarian diet caused the dogs to develop round skulls and a small stature. The dogs of all these islands were short, and their sizes vary from that of a lap-dog to the largest spaniel. Their head is broad, the snout pointed, the eyes very small, the ears upright, and their hair rather long, lank, hard, and of different colours, but most commonly white and brown. They seldom if ever barked, but howled sometimes, and were shy of strangers to a degree of aversion. Tahitian Dogs were offered and served by high ranking chiefs to the early European explorers who visited the islands. In 1767, British explorer Samuel Wallis observed the breed for the first time in Tahiti. They were bounded "with their fore-legs tied over their heads" and attempted to run away in an erect position; Wallis initially took them for "some strange animal". When trading with natives, Wallis' men accepted the offerings of hogs and cloth but untied the dogs and turned them loose, an act that confused the Tahitians. As the most effectual means to bring about a reconciliation, she [high chiefess Oberea] presented us with a hog, and several other things, among which was a dog. We had lately learnt, that these animals were esteemed by the Indians as more delicate food than their pork; and upon this occasion we determined to try the experiment; the dog, which was very fat, we consigned over to Tupia, who undertook to perform the double office of butcher and cook. He killed him by holding his hands close over his mouth and nose, an operation which continued above a quarter of an hour. While this was doing, a hole was made in the ground about a foot deep, in which a fire was kindled, and some small stones placed in layers alternately with the wood to heat; the dog was then singed, by holding him over the fire, and, by scraping him with a shell, the hair taken off as clean as if he had been scalded in hot water: he was then cut up with the same instrument, and his entrails being taken out, were sent to the sea, where being carefully washed, they were put into cocoa-nut shells, with what blood had come from the body; when the hole was sufficiently heated, the fire was taken out, and some of the stones, which were not so hot as to discolour any thing that they touched, being placed at the bottom, were covered with green leaves, the dog, with the entrails, was then placed upon the leaves, and other leaves being laid upon them, the whole was covered with the rest of the hot stones, and the mouth of the hole close stopped with mould: in somewhat less than four hours it was again opened, and the dog taken out excellently baked, and we all agreed that he made a very good dish. The dogs which are here bred to be eaten, taste no animal food, but are kept wholly upon bread-fruit, cocoa-nuts, yams, and other vegetables of the like kind; all the flesh and fish eaten by the inhabitants is dressed in the same way. 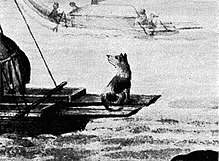 During Cook's second voyage, Forster brought two Tahitian Dogs aboard the ship to take home to England. They were tested with arrow poison at Malakula by having their legs opened with a lancet and inserted with the substance; both dogs recovered, though one later died from eating poisonous fish. However, the fate of the other dog and their remains is unknown. Western artists often infused Euro-American characteristics in their depictions of the dogs of Polynesia and possibly many actually depicted the pet dogs kept on European ships rather than native breeds. This resulted in few accurate depictions of the dogs surviving. A few works likely depicting the aboriginal dog breed done by Parkinson, Webber, Alexander Buchan and John Frederick Miller were compiled by American anthropologist Katharine Luomala including the two images above. In 1788, Charles Catton the younger, who did not accompany any of voyages, depicted an aquatint engraving of an "Otaheite Dog" in his book Animals Drawn from Nature and Engraved in Aqua-tinta. Based on its appearance and description, it may actually been a kurī instead. Artist Paul Gauguin depicted dogs in Tahiti and the Marquesas—although it is unclear whether they were the prototypical Polynesian Dog—in several works, including I raro te oviri (I) (Under the Pandanus I) (1891) and Arearea (Joyfulness) 1892. The prominence in his paintings of these collarless free range dogs has been the subject of much speculation as to their symbolic or metaphorical meaning. Archaeologic records indicate that dogs were present in the Society Islands from the period of initial settlement up to the point of European contact. Modern digs in Tahiti and the other Society Islands have uncovered few surviving remains of the Tahitian Dog. In 1960, a few canine teeth were uncovered at Ana Paia shelter, on Mo'orea. In 1962, a complete skull, limbs, and vertebrae were discovered at a marae site on Mo'orea along with a jawbone at another site on the same island. In 1973, American archaeologists Yosihiko H. Sinoto and Patrick C. McCoy discovered bone fragments of domesticated dogs and pigs in the early settlements of Vaiato'oia (near Fa'ahia) on the island of Huahine. ^ According to anthropologist Katharine Luomala, "This is the best picture I have found of what seems to be a native Polynesian dog: long muzzle, oblique eyes, prick ears, large head, stocky body, short legs, scraggly tail, patchy color, coarse hair, with only the alert look alien to descriptions." This depiction was either done by A. Buchan, S. Parkinson and J. F. Miller who were artists on the first voyage of Captain Cook. ^ Charles Hamilton Smith, who did not fully understand the Tahitian language, referred to this breed as the "Uri-Mahoi of Tahiti". ^ Nor were these explorers the last to eat dog. The Lewis and Clark expedition was so feted. Dog is not a normal staple of Native American diets, but it can be found in the Pacific and Columbian Basin. ^ Luomala, Katharine (July 1960). "A History of the Binomial Classification of the Polynesian Native Dog" (PDF). Pacific Science. Honolulu: University of Hawaii Press / Pacific Science Association. 14 (13): 201. hdl:10125/8347. OCLC 78130351. ^ Titcomb & Pukui 1969, p. 47. ^ a b c d e Smith, Charles Hamilton (1840). The Natural History of Dogs: Canidae Or Genus Canis of Authors ; Including Also the Genera Hyaena and Proteles. Edinburgh: W. H. Lizars. pp. 210–212. OCLC 860931. ^ a b c d e Titcomb, Margaret; Pukui, Mary Kawena (1969). Dog and Man in the Ancient Pacific, with Special Attention to Hawaii. 59. Honolulu: Bernice P. Bishop Museum Special Publications. pp. 24–29. OCLC 925631874. ^ Potts, Annie; Armstrong, Philip; Brown, Deidre (2014). A New Zealand Book of Beasts: Animals in Our Culture, History and Everday Life. Auckland: Auckland University Press. p. 117. ISBN 978-1-77558-004-1. OCLC 865334107. ^ Luomala 1960, pp. 193, 221. ^ a b Titcomb & Pukui 1969, pp. 1–48. ^ a b Byron, John; John Samuel Wallis, Philip Carteret, James Cook, and Joseph Banks (1773). An Account of the Voyages Undertaken by the Order of His Present Majesty for Making Discoveries in the Southern Hemisphere: And Successively Performed by Commodore Byron, Captain Wallis, Captain Carteret, and Captain Cook, in the Dolphin, the Swallow, and the Endeavor, Drawn Up from the Journals which Were Kept by the Several Commanders, and from the Papers of Joseph Banks, Esq. II. London: W. Strahan and T. Cadell. pp. 152–153. OCLC 9299044. ^ Luomala 1960, p. 215. ^ a b Luomala 1960, pp. 198–199. ^ a b Forster, Georg; Forster, Johann Reinhold (1777). A Voyage Round the World: In His Britannic Majesty's Sloop, Resolution, Commanded by Capt. James Cook, During the Years 1772, 3, 4, and 5. I. London: B. White. pp. 377–378. OCLC 1128197. ^ Rose, Roger G. (1993). "Taumi Gorgets from the Society Islands". In Philip J. C. Dark and Roger G. Rose (ed.). Artistic Heritage in a Changing Pacific. Honolulu: University of Hawaii Press. pp. 91–105. ISBN 978-0-8248-1573-8. OCLC 27938326. ^ Bennett, Frederick Debell (1840). Narrative of a Whaling Voyage Round the Globe from the Year 1833 to 1836. I. London: R. Bentley. p. 86. OCLC 317328883. ^ Luomala 1960, pp. 217–218. ^ Luomala 1960, p. 220. ^ Luomala 1960, pp. 198–199, 214, 216–217. ^ Luomala 1960, pp. 215, 217–218. ^ Gentry, Christine (1983). When Dogs Run Wild: the Sociology of Feral Dogs and Wildlife. Jefferson, NC: McFarland, Incorporated Publishers. p. 33. ISBN 978-0-89950-062-1. OCLC 8763678. ^ Luomala 1960, pp. 220–221. ^ Hawkesworth, John (1773). An Account of the Voyages Undertaken by the Order of His Present Majesty for Making Discoveries in the Southern Hemisphere: And Successively Performed by Commodore Byron, Captain Wallis, Captain Carteret, and Captain Cook, in the Dolphin, the Swallow, and the Endeavor, Drawn Up from the Journals which Were Kept by the Several Commanders, and from the Papers of Joseph Banks, Esq. London: W. Strahan and T. Cadell. p. 231. OCLC 66168420. ^ Williams, Glyndwr (2004). Captain Cook: Explorations and Reassessments. Rochester, NY: Boydell Press. pp. 81–82. ISBN 978-1-84383-100-6. OCLC 217755853. ^ Cook, James (1893). William James Lloyd Wharton (ed.). Captain Cook's Journal During His First Voyage Round the World Made in H.M. Bark "Endeavour" 1768–71. London: E. Stock. p. 90. OCLC 248081491. ^ Heringman, Noah (2013). Sciences of Antiquity: Romantic Antiquarianism, Natural History, and Knowledge Work. Oxford: Oxford University Press. p. 73. ISBN 978-0-19-162606-7. OCLC 838124158. ^ a b Holland, Leandra Zim (2003). Feasting and Fasting with Lewis & Clark: A Food and Social History of the Early 1800s. Emigrant, MT: Farcountry Press. p. 189. ISBN 978-1-59152-007-8. OCLC 54367613. ^ Forster, Georg; Forster, Johann Reinhold (1777). A Voyage Round the World: In His Britannic Majesty's Sloop, Resolution, Commanded by Capt. James Cook, During the Years 1772, 3, 4, and 5. II. London: B. White. pp. 3, 40, 42–43, 45, 126, 130, 226, 233, 237, 244–246, 289, 339, 405–406, 439. OCLC 1128197. ^ a b Luomala 1960, pp. 193–195. ^ Luomala 1960, pp. 170–180. ^ Luomala, Katharine (April 1962). "Additional Eighteenth-Century Sketches of the Polynesian Native Dog, Including the Maori" (PDF). Pacific Science. Honolulu: University of Hawaii Press / Pacific Science Association. 16 (2): 170–180. hdl:10125/5950. OCLC 16324444. ^ Catton, Charles (1788). Animals Drawn from Nature and Engraved in Aqua-tinta. London. p. 122. OCLC 27786299. ^ "Otaheite Dog". New Zealand Antique Prints & Rare Books. Retrieved 15 March 2017. ^ "Under Pandamnu I Rare Te Oviri". Dallas Museum of Art. Retrieved 15 March 2015. ^ "Paul Gauguin – Arearea". Musée d'Orsay. Retrieved 7 February 2015. ^ The Bark. "Paul Gauguin, Mythic Life Painting". The Ultimate Global Traveler. Retrieved 15 March 2015. ^ Maurer, Naomi E.; Van Gogh, Vincent (August 1998). The Pursuit of Spiritual Wisdom: The Thought and Art of Vincent Van Gogh and Paul Gauguin (Hardcover). Dickinson, New Jersey: Fairleigh. p. 154. ISBN 0838637493. Retrieved 5 April 2017. ^ Greig, Karen; Walter, Richard; Matisoo-Smith, Elizabeth A. (2015). M. Oxenham & H. Buckley (ed.). Dogs and people in Southeast Asia and the Pacific. The Routledge Handbook of Bioarchaeology in Southeast Asia and the Pacific Islands. Abingdon, UK: Routledge. pp. 462–482. ISBN 978-1-317-53401-3. ^ Sinoto, Y. H.; McCoy, P. C. (1975). "Report on the preliminary excavation of an early habitation site on Huahine, Society Islands". Journal de la Société des Océanistes. Paris: Societe des Oceanistes. 31 (45): 143–186. OCLC 902108847. This page was last edited on 22 August 2018, at 02:16 (UTC).